for one buck a lesson? Last I checked, piano lessons were running about $25. per half-hour. And even then you don't know if the teacher knows what they are talking about or can explain how chords work so you can understand. PDF downloadable book with 39 lessons -- 104 pages! That's exactly why you should take piano lessons from "the man who wrote the book" -- the guy who has written over 25 books on piano playing and recorded over 500 videos, DVD's, CD's, charts, music games, and so forth. He knows chords like nobody else, and he knows how to teach chords so that you can understand them too. So for you to take lessons from him for one buck a lesson is a no-brainer. Do it. Do it now. You'll be absolutely thrilled! This is a downloadable e-book, so you can download it right now and have it now! 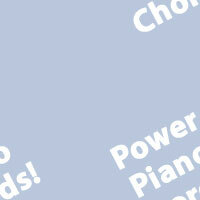 1 - "What Chords Do I Absolutely, Positively Need To Know?" 2 - "Flying Over Chordland - The 48 Basic Chords - Times 3"
3 - "All The Major Chords"
4 - "All The Minor Chords"
5 - "Inversions: Chords On Their Heads"
6 - "All the Diminished Triads"
7 - "All the Augmented Triads"
8 - "All the Major 6th Chords"
9 - "All the Minor 6th Chords"
10 - "All the 7th Chords"
11 - "All the Maj7th Chords"
12 - "All the 9th Chords"
13 - "All the 11th Chords"
14 - "All the 13th Chords"
15 - "The Three Diminished 7th Chords"
19 - "Oops! I forgot Minor 7th Chords!" 20 - "Chord Progressions Part I - The Circle of Keys"
21 - "Chord Progressions Part 2 - The Circle of Minor Keys"
22 - "How To Find The Key of a Song When There Are Flats In The Key Signature"
23 - "How To Find The Key of a Song When There Are Sharps In The Key Signature"
27 - "The 'II - V7 - I' Chord Progression"
28 - "The 'VI - II - V7 - I' Chord Progression"
34 - "How To Create Unlimited Original Chord Progressions Using Chord Substitutions - Part 1"
35 - "How To Create Unlimited Original Chord Progressions Using Chord Substitutions - Part 2"
36 - "How To Create Unlimited Original Chord Progressions Using Chord Substitutions - Part 3"
37 - Gospel Chord Progression #1 - "Get On That Church!" 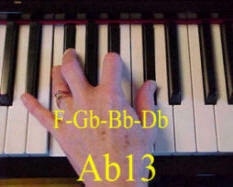 38 - Gospel Chord Progression #2 - "Get On That V7 Chord!" 39 - "It's Graduation Day!" And you'll not only be able to SEE every chord, but if you have an internet connection, you can go to a web site where you can HEAR Duane himself explain and illustrate each chord and each progression! There's no extra charge for that -- but is only available to those who purchase this e-book. That means that you will have access to every one of the 39 lessons Duane has put online -- you'll hear him explain each lesson, and see each chord in living color just by clicking on the links in the Table of Contents! You can download it as soon as your credit card clears -- even if it is the middle of the night -- and a very short time from now you can be playing and understanding chords like you never have before! And remember -- you're getting all 39 lessons for one buck per lesson! So do it now, before you forget. P.S. 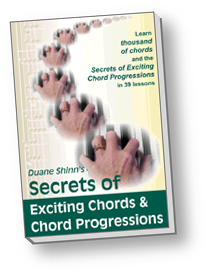 : Don't forget that these 39 lessons -- for 1 buck per lesson -- cover hundreds and hundreds of chords and chord variations and chord progressions -- the book is 104 pages loaded with tons of photos of chords and audio files so you can hear as well as see. So if you divide the $39. price by the number of chords and progressions, you're really paying something on the order of pennies per chord! And of course there is no shipping, since you can download the entire course to your computer!